Archer Robin Hood Video Slot Guide & Review - Casino Answers! Archer is a 5-reel, 243-way video slot developed by Playtech, featuring wild symbols, scatter symbols, a gamble feature, an expand and split feature and a free spin feature. You can play the Archer video slot at Europa Casino and Omni Casino. 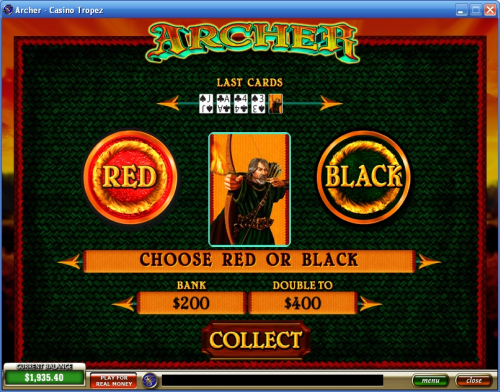 Archer is an all ways video slot, meaning that winning combinations can be in any position from left to right on adjacent reels (beginning with the first reel). For instance, if a symbol appears on the top position on the first reel, bottom position on the second reel and the middle position on the third reel, it will still count as a winning combination. If you hit 5 Robin Hood symbols on a way, you will win the top jackpot of 1500 coins X your bet multiplier. The next highest payout is 1000 coins. The wild symbol on the Archer 243-ways video slot is the Gold Coins symbol. It appears on the second, third and fourth reels and substitutes for all symbols except for the scatter symbol. It does not pay out by itself. If a symbol with an arrow border appears on the reels with a scatter symbol, it will trigger the Expand & Split feature. The symbol will expand to occupy all positions on the same reel, but does not replace the symbols already there. This will create many new opportunities for winning combinations. All wins are paid after all symbols expand. Each shared and expanded symbol is evaluated individually. Wins are paid per symbol, per reel with the highest combination paid out. The scatter symbol on the Archer slot machine is the Arrows symbol. If you hit 3 Arrows symbols anywhere on the reels, you will win 7 free spins. During the free spins feature, the Expand & Split feature is triggered for any symbol with an arrow border in a winning combination, regardless of whether the scatter symbol is present. 3 or more scatter symbols will trigger 7 additional free spins. Free spins can be re-triggered infinitely. There are even more in-game features in Archer. There is an autoplay setting where you can play up to 99 spins automatically. You may cancel the autoplay mode at any time. There is also a skill stop feature that can be used to stop the reels mid-spin. Archer is definitely a change of pace from the regular payline video slots. There aren’t too many all ways video slots around, so things might be a little confusing at first, but once you play a few spins on them, you will get the hang of it. While Archer does have a recognizable theme to it, it doesn’t come into play as much as you might expect due to the lack of a bonus game. To try out the Archer 243-ways video slot, sign up now at Europa Casino! Are there any other Robin Hood video slots? 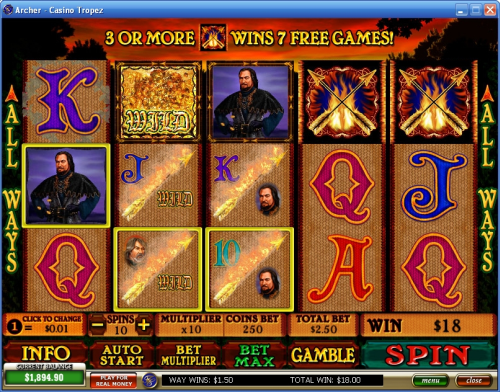 Yes, you can also play the Prince of Sherwood video slot from Realtime Gaming at the US-friendly Winpalace Casino. Where can I play other all-ways video slots? You can play more 243 ways video slots such as Thunderstruck II, Alaskan Fishing at Microgaming casinos such as All Jackpots Casino. Are USA players able to play the Archer video slot? Unfortunately, American players are currently unable to play at Playtech online casinos. However, if you are looking for a 243-way video slot that is USA-friendly, we recommend you try the Grail Maiden video slot at Millionaire Casino. What is an all ways video slot? An all ways video slot is a video slot that disregards paylines. Instead of winning combinations being in a specific line, they only have to be in subsequent reels. A symbol can be anywhere on the first, second and third reel (also fourth and fifth) for a winning combination. Are there any casino games based on Robin Hood? Where can I play an online Robin Hood game?